As a leader of the Montreal Canadiens, the value of P.K. Subban hockey cards and autographed memorabilia have plenty of room to grow. 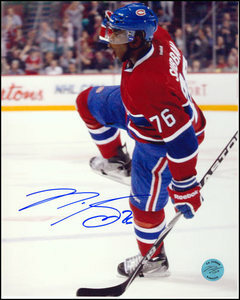 Drafted in the second round of the 2007 NHL Draft, he has already won a Norris Trophy as the league's best defenseman. Playing for the Canadiens means every move you make is under close scrutiny and Subban has risen to the challenge. P.K. 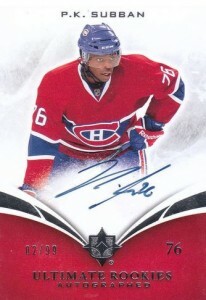 Subban rookie cards can be found in many 2010-11 products and across multiple price points. He is one of the key rookies from the year's draft class. He has a total of 22 rookie cards, half of which are autographed. 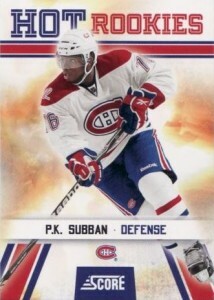 His pre-rookie cards date back to 2007-08 In the Game Heroes & Prospects. 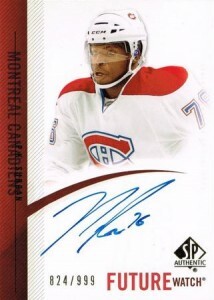 In addition to his base card, Subban also has a certified autograph card in the product. P.K. 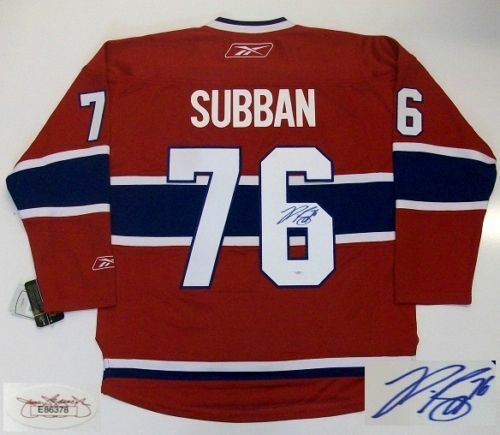 Subban's autographed material is readily available. 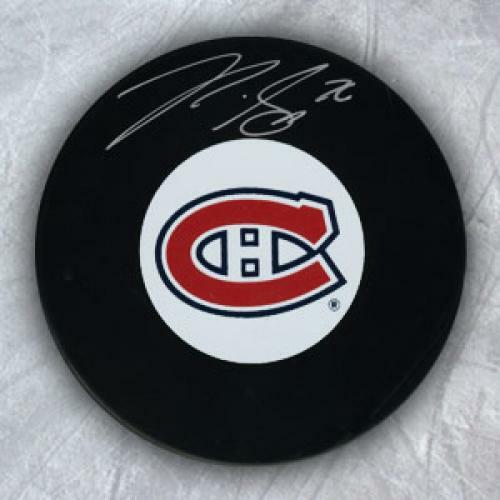 Pucks, jerseys and photos are among the items he is most frequently asked to sign. 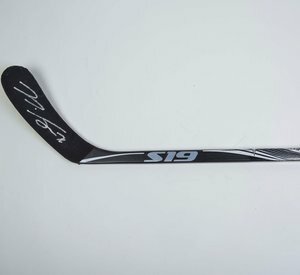 Autographed sticks do exist but are not nearly as plentiful. They are, however, not on the inexpensive side of the scale. Since it's creation as a brand in 2005-06, The Cup has been a highly anticipated release by hockey collectors, year-in and year- out. Collectors consistently appreciate the low serial numbering, on-card autograph and patch swatches that The Cup is famous for. 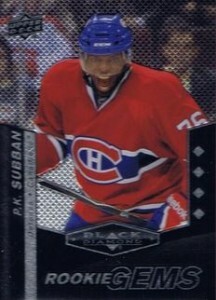 Subban's card is no exception. After The Cup, the subject of "best rookie card" has always been a great debate among hockey collectors. SP Authentic is a worthy adversary as are cards from SPx. However, when it comes to a clean design, good photography and on-card signature, Ultimate Collection is certainly deserving of being in the conversation. Panini's Dominion brand is their high-end answer to The Cup. 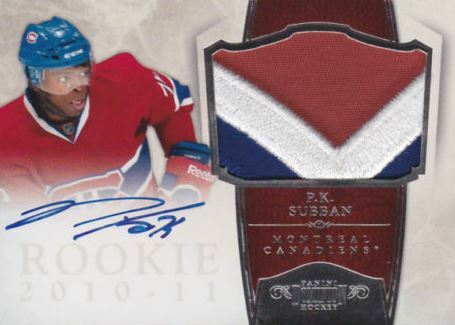 In this particular case, the Dominion card design and the inclusion of a multi-color patch makes it, in some ways, superior to Subban's Cup rookie. However, the brand loyalty that collectors have towards The Cup consistently causes it to sell for more. 2016-17 Upper Deck SP Game Used Banner Year Winter Classic BWC-PS PK Subban P.K. Below you will find examples of what an authentic P.K. 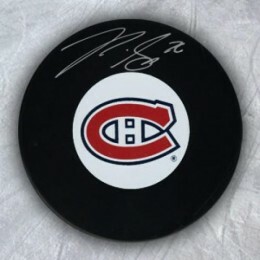 Subban autograph looks like. This can be used as a first point of reference for determining the legitimacy of autograph memorabilia, but is not a substitute for having your items authenticated by a well-respected professional autograph authentication company. Some of the trusted sources within the sports memorabilia market include the following companies: PSA, JSA, and Mounted Memories. Click on any of the images below to view full size photos. It is very quick and fluid signature that is not very legible. The first character looks like an oddly drawn "3" or a "2" with an extra long tail. The second character is an "S" that comes to a point on the top. It is written on almost a 45-degree angle. His jersey number "76" is often inscribed. NASHVILLE PREDATORS PK SUBBAN signed auto'd SPORTS ILLUSTRATED PSA DNA COA! P.K.